(0 Customer Reviews) | Write Review 8 issues per year Global Health and Travel is your premier source on medical tourism. The magazine focuses on services offered by internationally-accredited healthcare institutions typically sought by travellers. These include elective procedures like cosmetic surgery and dental treatment, to complex, specialised procedures such as joint replacement for hips and knees, cardiac surgery, fertility treatment and more. Combined with vibrant and informative stories on beauty, travel, health and wellbeing, Global Health and Travel is your reliable guide to healthcare abroad. Global Health and Travel is your premier source on medical tourism. The magazine focuses on services offered by internationally-accredited healthcare institutions typically sought by travellers. These include elective procedures like cosmetic surgery and dental treatment, to complex, specialised procedures such as joint replacement for hips and knees, cardiac surgery, fertility treatment and more. Global Health and Travel is your premier source on medical tourism. The magazine focuses on services offered by internationally-accredited healthcare institutions typically sought by travellers. These include elective procedures like cosmetic surgery and dental treatment, to complex, specialised procedures such as joint replacement for hips and knees, cardiac surgery, fertility treatment and more. Combined with vibrant and informative stories on beauty, travel, health and wellbeing, Global Health and Travel is your reliable guide to healthcare abroad. 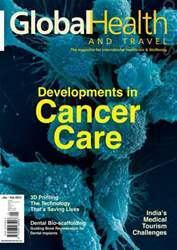 You'll receive 8 issues during a 1 year Global Health and Travel magazine subscription. You'll receive 8 issues during a 1 year Global Health and Travel magazine print subscription.